Houzz 73 of our visitors have told a friend about this plan. Question: Do you have an image of the basement, or can you describe the size and any supports or room divisions? Answer: Good Afternoon, The basement is not finished. No room division. The only item in the basement is the furnace and water heater. The basement takes the shape of the first floor heated space. Does not include the garage. Question: will the duplex plan allow the builder to build an attached sun room in the back of the homes? Answer: Assuming that the sunroom would be gabled and the ridge would run from front to back, it could certainly straddle the chimney and be easily accessed from the great room. I hope this helps. 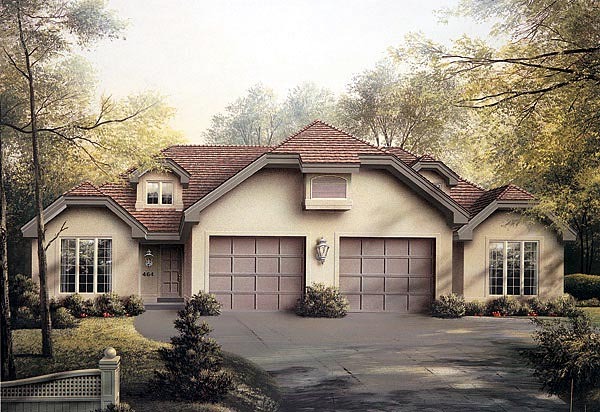 Question: I would like to see a more traditional exterior to this plan, in brick or stone/stucco, as well as a more traditional and simple roof line in the front in order to hold down construction costs. How would this look? Answer: Thank you for your interest in our plans. 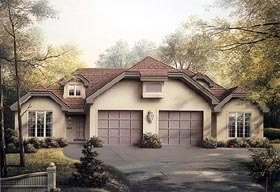 Unfortunately, this plan was only designed with the stucco exterior. We believe that brick or siding would look great on this plan and those changes can be made with plan modifications but the way it is shown in the picture is the way the original designer intended. Answer: This plan comes standard with a basement but no, you do not have to build it on a basement. 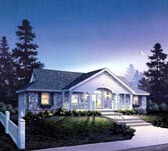 The plan can be modified to fit your needs either on site or by a professional. The living area and the master bath do not step down but yes, there are steps to the basement.